National Heart Month rolls on, and we’ve already looked at risk factors for high blood pressure and other preventative measures. But what happens when your loved one is the person afflicted with potentially crippling heart issues? Amid all the emotions and fears, what do you do? To whom and where do you turn? What is hardest for you about controlling your high blood pressure? Have you set specific goals with your health care team? Provide emotional support. Be positive. Help your loved one remember that this is a marathon, not a sprint, and that control is possible. Things will get better. Communicate. If you are concerned about your loved one, ask him or her questions and start a conversation about their health, their feelings as well as yours. Don’t forget to take care of yourself. As a family member or friend taking care of a loved one with high blood pressure, you may experience bouts with stress, anxiety, depression and despair. Remember, taking care of your own emotional health and physical needs helps you take care of someone else. Make control YOUR goal. Help your loved one set up a routine to take medications regularly. Start a reminder system. Use a pillbox for every pill, every day. Or find and use a smartphone app. Set a reminder to get your loved one’s blood pressure checked. At home, at the doctor’s office or at a pharmacy. Track results. Keep a journal or diary that your loved one can take to health care visits. Help your loved one eat better. Go grocery shopping together. Focus on more fresh fruit, vegetables and whole grains and fewer processed foods like sweets, fast food or other foods high in saturated fat and sodium. Help cook healthy, tasty, home-cooked meals. If your loved one smokes, help him or her quit. Be more active together. Schedule easy exercises like walking, keep track of daily and weekly physical activity and increase time and intensity of physical activity gradually as you progress. Check out more ideas for taking control of your blood pressure or that of a loved one. 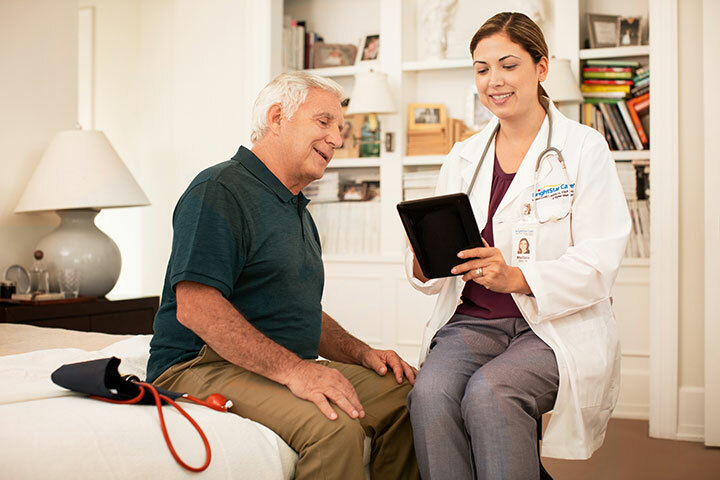 If you think you or a loved one may need additional support managing blood pressure and other conditions, contact our local home care team for more information on how we can help.